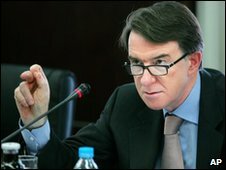 Some of the biggest names on the web have written to Peter Mandelson to express "grave concerns" about elements of the Digital Economy Bill. Facebook, Google, Yahoo and eBay object to a clause that they say could give government "unprecedented and sweeping powers" to amend copyright laws. "We urge you to remove Clause 17 from the bill," the letter read. However, the government has said it believes the clause will "future-proof online copyright laws". Others have suggested that the clause could be used to tweak laws so that search engines could not publish summaries of news stories in their results. "Business will not wake up one morning to a world in which government has taken extensive digital powers," the spokesperson said. "There are substantial constraints on how the power can be used, with requirements for a consultation and votes in both houses of Parliament before anything can happen." However, the consortium of companies say the clause is so broad ranging that it could risk "legitimate consumer use of current technology as well as future developments". "We all acknowledge that new business models need to emerge to support creative content," the letter from European and UK representatives of the firms reads. "They are inherently risky and entrepreneurs rely heavily on there being a consistent and stable approach to copyright enforcement. "This clause would inject an unprecedented level of uncertainty in this regard." Other groups including US digital rights group The Electronic Frontier Foundation have objected to it. Clause 17 is part of the government's Digital Economy Bill, outlined in the Queen's speech in November 2009. The bill includes a shake-up of the radio spectrum, a classification system for video games and plans to tackle illegal file-sharing. The so-called "three strikes" element of the bill would give regulator Ofcom new powers to disconnect persistent net pirates. The plans have proved controversial with lobby organisation The Open Rights Group urging people to contact their MP to oppose the plans. The bill will have its second reading in the House of Lords on 2 December. It will have to go through various other readings and drafts before it becomes law.